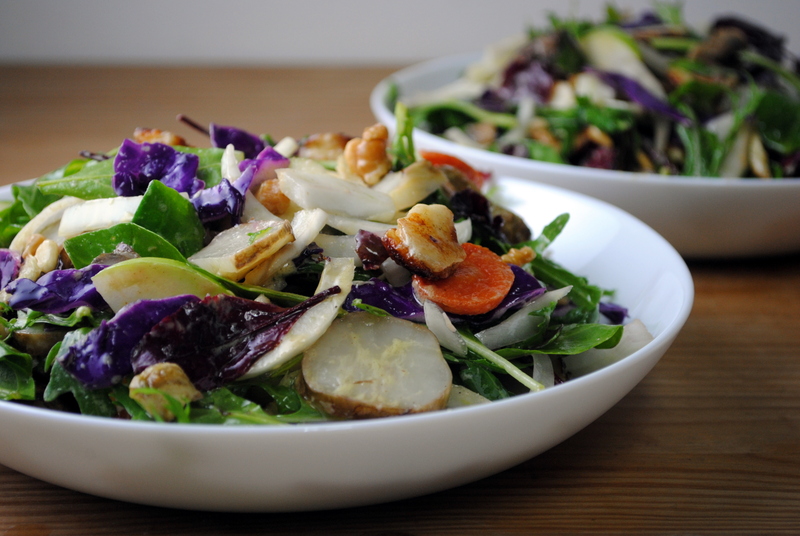 This recipe may have begun with the sunchokes, but it’s all about the halloumi. Sunchokes, also known as Jerusalem artichokes, are everywhere right now. And while we might be in Israel, those nobby little roots that look like ginger or turmeric have nothing to do with Jerusalem. I bought a pound without a plan and while I’ve most often had them in the form of creamy soup, I got it into my head that I wanted to roast them and put them in a salad. I thinly sliced some so they’d get crispy and serve as a sunchoke chip garnish. My favorite salads in Israel all have fried halloumi in them. The first time I heard of this strange, semi-hard cheese was after my sister spent a month in Cyprus. Although it’s typically a mixture of goat and sheep’s milk, halloumi is very mild in flavor. And because it has an unusually high melting point for cheese, it’s perfect for frying, which is how I’ve always seen it served. Another salad I ate recently (at Colony in Jerusalem) had braised fennel, which added an extra layer of flavor and a subtle sweetness. 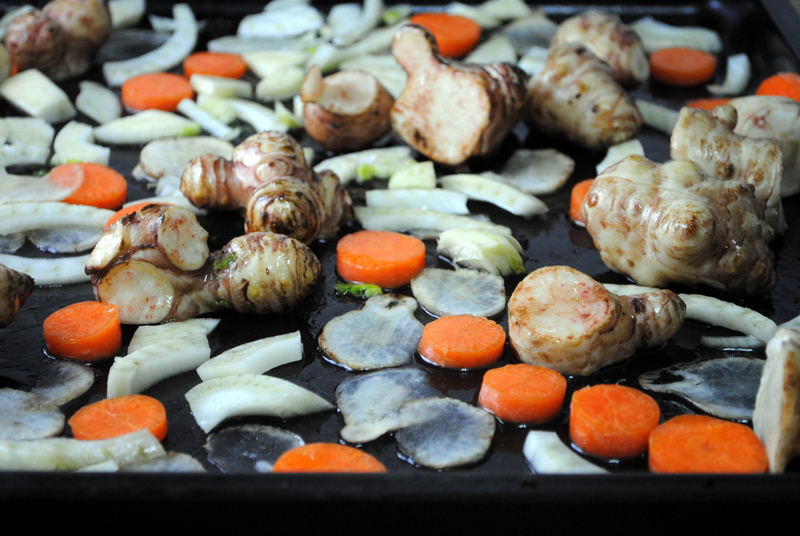 I decided to include it both roasted and raw, to get both sides of the fennel flavor and two different textures. Finally, I had some mushrooms I needed to use up, so I sliced and sauteed them because I have a thing for cooked mushrooms in my salads. This is another one of those recipes that should really serve as a guideline, an inspiration, rather than literally. The salad was excellent – hearty, filling, and flavorful – but would be just as delicious with red peppers, cucumbers, tomatoes, or anything else mixed in. The one real secret to this salad is the dressing. A simple French mustard dressing, this was the first salad dressing I truly liked as a teenager. My friend’s French mother taught it to me and I’ve been making it ever since. This is actually the first time I’ve measured as I’ve gone, usually I just taste and adjust. Preheat the oven to 400F. Slice one of the sunchokes into paper-thin slices. Halve the remaining sunchokes. Toss the sunchokes, carrots, half of the sliced fennel with olive oil and salt. Roast for about 20 minutes, or until tender. 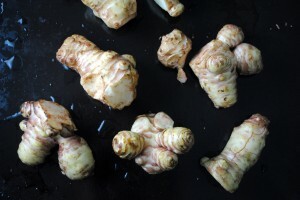 You may need to remove the thinly sliced sunchokes earlier if they get crisp. Saute the mushrooms in a little olive oil over high heat for just a few minutes, until they are cooked and slightly browned. Or, to keep things simple, you can just keep them raw. Remove the mushrooms and set aside. Heat a little olive oil in the pan over high heat and fry the halloumi. Be sure not to crowd the pan, otherwise the cubes will stick together. Flip once and remove from the heat once crispy ob both sides. Put all ingredients in a large salad bowl and toss with the mustard vinaigrette (recipe below). 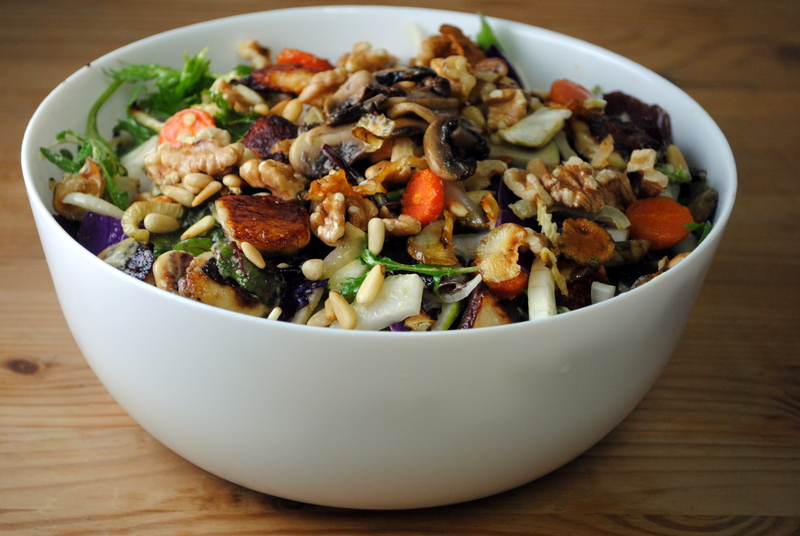 Note on dressing salad: the very best way is to put a little dressing at the bottom of the bowl, then the salad, then some on top and toss to combine. Whisk together all ingredients until emulsified and combined. Season with salt and pepper and add more olive oil, lemon juice or dijon mustard to taste, if needed.